When the need to comply with strict discharge limits arises, our Metal Scavenging Systems can remove metals to parts-per-billions levels. Metals such as copper, nickel chrome, and lead can be recovered with this type of system. Lower waste disposal volumes and costs. Capable of providing a payback in less than a year. Duplex and Triplex designs are available. Reduced operating costs over conventional treatment. After conventional treatment, polish waste streams to meet discharge limits. Our Water Recycling Systems are used to recycle millions of gallons of water daily. If your needs are to reduce costs, improve the quality of your rinse water, or simplify environmental compliance, our water recycling system can meet or exceed your goals. Lower wastewater treatment, water, and sewer costs. Eliminate the need for service exchange bottles. Provide high purity rinse water. 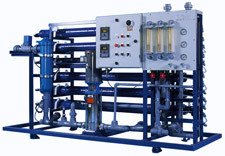 Our Ion Exchange Systems are engineered for cost effective water purification. The Ion Exchange Systems are used in closed loop water recycling systems and for the removal of selected metals from waste streams.